If you are not familiar with Cg/HLSL shading language, then you may consider downloading a ready-to-use shader from the Unity Asset Store. First, let us focus on the problem. 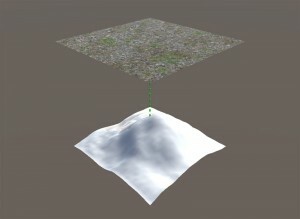 The Unity terrain is textured according to the UV coordinates. They are evenly distributed on the X-Z plane. The Y-axis is ignored, and a texture is stretched on tall objects. 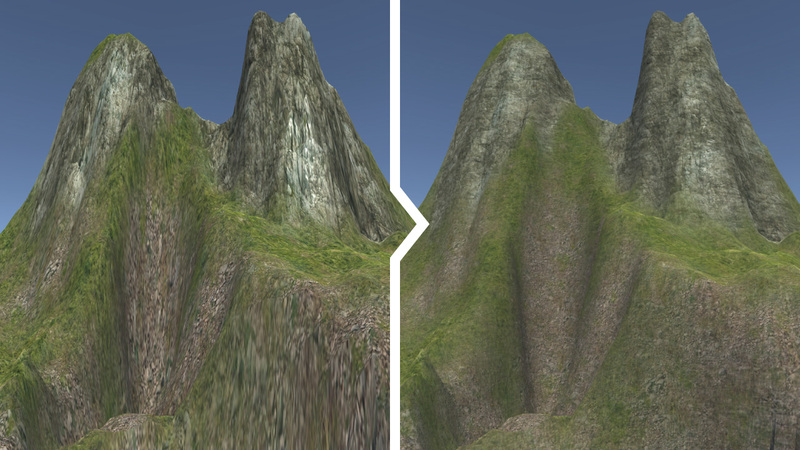 It gives relatively good results if there are no steep cliffs, or a player looks on the terrain from above. There are many ways to solve this problem. 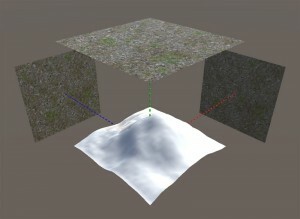 One of the simplest is the triplanar mapping. It samples a texture from three different directions: X, Y, and Z. Finally, the result is blended into one color. It gives smooth transitions between surfaces at different angles. The same method can be applied for sampling normal maps. The discussed technique provides much better graphics, but it is slightly more computationally expensive. However, if performance is not critical, then it is more efficient than preparing the same terrain in 3Ds Max or Blender.